It is often assumed that Iran must necessarily submit to the forces of globalization and liberalize its economy, but the country’s ruling elites have continued throughout the post-revolutionary era to resist these pressures for neo-liberal economic reform, seeking to survive in the battlefield of today’s globalizing economy whilst remaining loyal to their own rules of engagement. 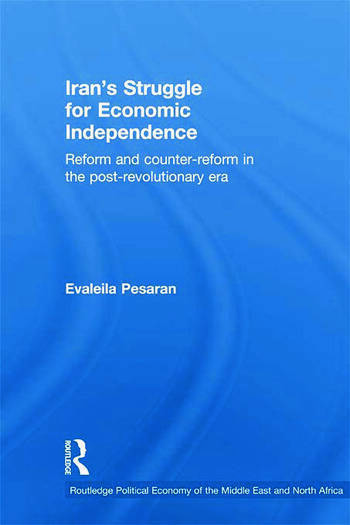 This book analyzes the dynamics of economic reform in the Islamic Republic of Iran as they have played out in this post-revolutionary struggle for economic independence from 1979 up to the present day. It shows how, although some groups within the Iranian elite are in favor of opening up the economy to the inflow of foreign capital – believing that lasting independence requires economic growth powered in part by investment from abroad – others argue that such economic liberalization might endanger Iran’s national interests and put the survival of the post-revolutionary regime at risk. By examining the political causes of the ongoing tug-of-war that has taken place between these two sides of reform and counter-reform, this book provides a new approach to understanding the complex process of economic policy-making in the Islamic Republic of Iran, which will be relevant to future examinations of the political economy of the Middle East. Evaleila Pesaran is a College Lecturer in Politics at Murray Edwards College (formerly New Hall) and Pembroke College, University of Cambridge, UK.